Are you looking to customize your WordPress login page? Customizing the login page helps you to display a consistent brand to your users, giving your site a more professional appearance. In this article, we’ll show 5 different WordPress tweaks to customize your login page. 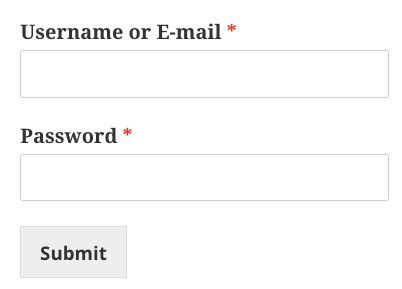 If you run a community website, you might want to customize the login form on your site. Creating a custom login form instead of using the default WordPress form is a great way to improve the user experience, and it enables you to embed the form anywhere on your site. WPForms allows you to easily create a custom login form with the drag and drop builder. To create a custom login form, you’ll need to install the user registration addon on your site. After installing the addon, you can easily create a custom login form by choosing the User Login Form template in your form builder. For more details on creating and customizing your form, you can learn how to create a custom login form with WPForms. The best thing about using a custom login form is that you can embed it anywhere on your site, whether it be sidebar, footer or any other pages. However, your visitors can still access the default login page if they try to access it. If you want to redirect your visitors to a custom login page when they try to access the default page, all you need to do is to add the following code snippet to your functions.php file. If you’ve never added code to your functions.php file, you can see this guide to pasting snippets from the web into WordPress. Alternatively, you could create a site-specific plugin so it works even if you switch themes. Make sure to replace the login page URL with your custom login page URL in the code. By default, WordPress allows you to log into your site by entering either your username or the email address along with the password. If someone wants to break into your WordPress site, knowing an email address could potentially make it easier for them to break in by guessing your password or hacking your email account. If you want to provide an extra layer of security to your website, you can easily disable email login feature on your site. To disable login with email, you just need to install and activate the No Login by Email Address plugin. The plugin works out of the box and no further configuration is required. Security is a big concern that stops your visitors from submitting their personal details. When you run a community powered website, you need to ensure your form’s security by adding SSL to your site. SSL is an industry standard security measure that creates an encrypted link between each visitor’s browser and your website. After you install the SSL certificate on your site, a small green padlock icon will appear in the address bar, telling your visitors that they’re on a secure page. After having SSL certificate installed on your domain, you can force your website to SSL mode for secure user login if it doesn’t automatically redirect you to the secure page. To do this, simply add the following code snippet to your wp-config.php file. 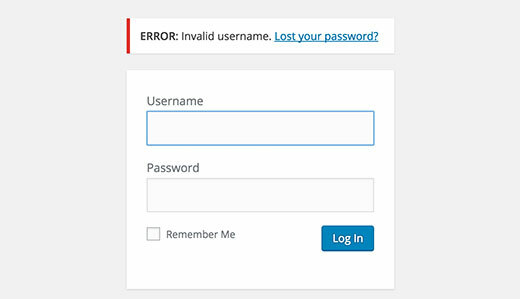 By default, WordPress shows you a log error message when you try to log into your site with the wrong login credentials. While this error message can be helpful to users, it can also be a great threat to the security of your website because it gives hint about the wrong credentials, potentially making it easier for the bad guys to break in. You can easily disable the WordPress log error message by tweaking the functions.php file of your WordPress theme. Just add the following code snippet to your functions.php file. You can customize the text to change the message that displays when someone enters the wrong credentials. We hope this article showed you some easy hacks to tweak your WordPress login page. If you enjoyed this article, you might also want to read how to create a custom user registration form in WordPress, and check out these simple tricks to fight back against spam user registration. Thanks for sharing this knowledge. You have shared very interesting points here. Glad that you find the post interesting, Emily. Thanks!